← WANT THE FACTS ABOUT CHIP CARDS? Accepting eCommerce payments on-line can be arranged by integrating an eCommerce shopping cart with an Internet payment gateway in conjunction with an eCommerce merchant account, and applying appropriate data security standards. According to PYMNTS.com, less than one third of new retail stores selling to consumers offer on-line payments to their customers, and that, “could spell doom in this connected and convenience-driven market.” Read the article. Online sales are increasing year-over-year. About 190 million U.S. consumers—more than half the population—will shop on-line this year, according to Forrester Research, as reported in the Wall Street Journal. Read the WSJ article. One reason so few new businesses accept on-line payments from the start may be that it appears to be a difficult project. So let’s divide it into its parts and simplify things. As an example, let’s look at how a small-sized or medium-sized business would include customer on-line payments capability as it creates an eCommerce web-site. As the web-site is being designed, consider how information about the products and services to be sold is managed and how to accept payments on-line in a secure environment. These tasks can be accomplished in a straight-forward manner. A qualified web-site developer can recommend an appropriate shopping cart for the web-site. A professional merchant services representative will arrange an Internet payment gateway and a merchant account, and will help the business comply with data security standards. An eCommerce shopping cart is the content management system which typically provides the web-site with a catalog of available products and services, pricing, product images, and consumer reviews. It may also include features for shipping, analytics, and marketing. When selecting a shopping cart, choose one certified by your Internet payment gateway and merchant services providers to ensure compatibility. 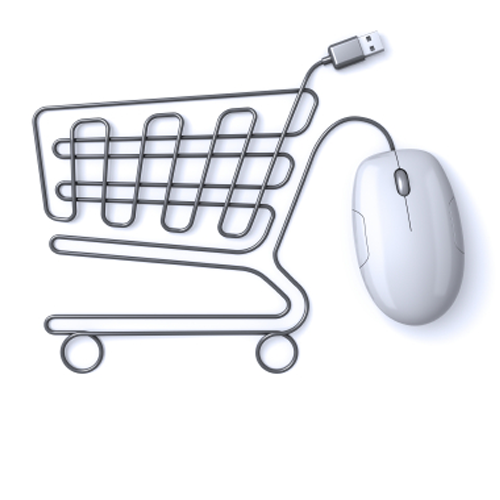 Click here for a convenient guide to finding the right shopping cart for your business. What is an Internet payment gateway? An Internet payment gateway makes payment processing available using any device having an Internet connection. As used in eCommerce, it connects the merchant’s web-site with a card processing company to facilitate payment transaction authorization, data capture and settlement. When a retail customer makes an eCommerce payment, the payment gateway immediately sends a transaction authorization request to the card processor. The processor forwards the request either to the institution that originally issued the card to the customer or to the institution that holds an eCheck associated bank account. The institution verifies that an account is active and open and that there is sufficient credit or funds available to cover the purchase amount. Fraud control procedures attempt to identify suspicious transactions. The result of the authorization request is returned to the eCommerce web-site. If the customer has provided an e-mail address, then a receipt for an authorized transaction can automatically be provided to the customer. If the transaction is declined, then a reason is provided. Payment gateways also facilitate data capture, clearing and settlement activities by periodically closing and transmitting batches of transactions to the payment processor for its use in performing these functions. The clearing function exchanges non-financial transaction data among financial institutions and the settlement process exchanges the funds associated with the cleared transactions. Click here for more information about clearing and settlement. A merchant account is a bank account specifically designed to process customer payments. Retail eCommerce payments primarily consist of electronically processed credit card, debit card, and electronic check payments made by customers as they shop at an eCommerce web-site. When arranging a merchant account, use an experienced merchant services representative. A professional representative will be knowledgeable and focused on understanding and responding to your specific goals. The representative will educate you as necessary to help you achieve your objectives, will offer appropriate recommendations, and will maintain a long-term focus that can help you as your business grows. Your merchant services representative will help you complete the merchant account application packet, which is a collection of information about the business, its principals, processing limits, and rates and fees. A complete packet will disclose important information about liability of the parties, assumed risks, and how disputes are handled. It will identify responsibilities of the bank that will maintain the merchant account and responsibilities of the merchant. The application packet for an eCommerce business will include pertinent information about how the business is conducted and standards for accepting payments over the Internet. These standards relate to things like how the business will handle disclosures, refunds, cancellations, shipping, and privacy. Although data security is never fool-proof, optimizing it will help protect customers from fraudulent use of their sensitive cardholder information. It also will help the business protect itself from liability for fraudulent transactions and from loss of goodwill. The payment card industry has implemented standard policies and procedures to help businesses and financial institutions reduce fraud by protecting their payment systems from breaches and theft of cardholder data. These standards apply to any merchant that processes, stores or transmits credit card data, regardless of size. A small-sized to medium-sized business complies with these policies by, at a minimum, completing an annual self-assessment questionnaire. eCommerce merchants may be subject to periodic external scans of their computer systems to ensure that they are secure from unauthorized data access. Larger firms are subject to on-site inspection of facilities. These checkpoints are intended to help businesses and service providers enact appropriate safeguards. A professional merchant services representative can educate the eCommerce merchant regarding the standards and can arrange for a qualified security assessor to monitor and assist with technical aspects of compliance. Click here for the PCI Security Standards Council web-site on PCI security. Accepting on-line eCommerce payments is important for the sustainability and growth of the business. To implement on-line payments, select the right shopping cart and implement the components of Internet payments acceptance: Internet payment gateway, merchant account, and appropriate data security standards. A qualified web-designer and professional merchant services representative can help you meet your objectives and prepare for the future. This entry was posted in eCommerce, Electronic payments, Mobile payments, On-line payments. Bookmark the permalink.